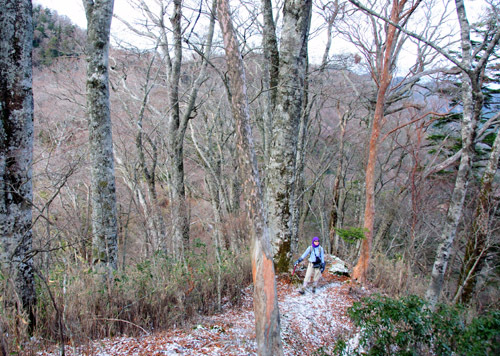 Last weekend, we did this hike as a part of our cold-weather training for an upcoming winter bicycle tour in Shikoku. It is about 50km in total length and took us 17 1/2 hours of walking time over two days; we carried fairly heavy packs with winter camping gear. 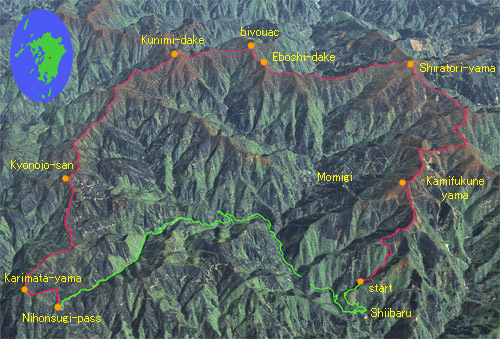 The trails in the Sekiryo are typically narrow with many obstacles, so progress is typically limited to 2-3km/h. 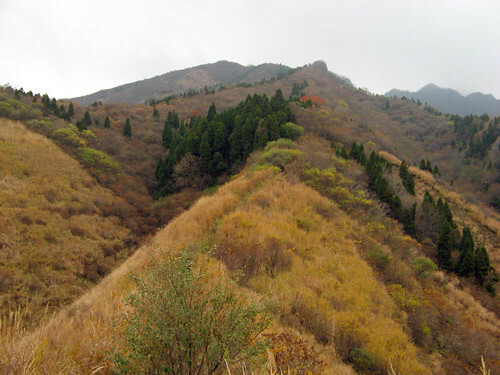 The set of trails on this hike is actually easier than what is typical here, and the northern section has recently been improved by cutting a wider swath through the thick bamboo grass. On the morning of the second day, we reached Kunimi-dake, at 1739m the highest peak in the Sekiryo, to be rewarded with unlimited views of the entire island of Kyushu in the crystal-clear air, from the Oosumi peninsula 150km to the south to the mountains of Fukuoka prefecture more than 100km to the north. A fitting reward for enduring the previous cold day and night. 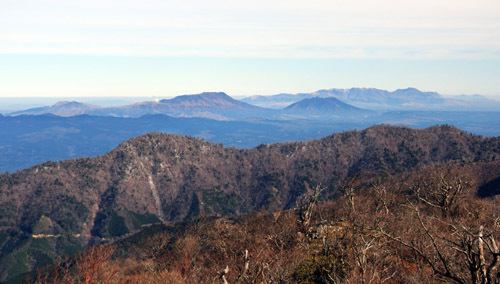 The Aso caldera looks very close in this view from Kunimi-dake in the clear morning air. 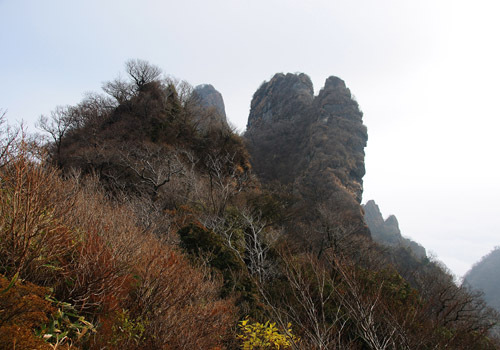 Beyond the karst peak of Tenshuzan (foreground) the south part of the large crater rim shows as a dark ridge. 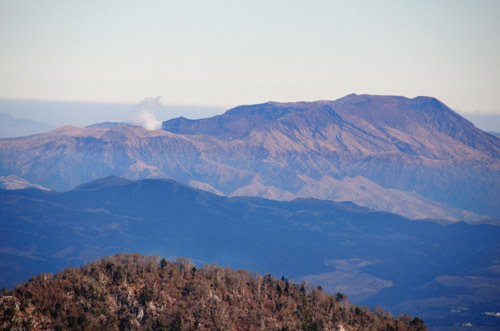 Beyond, the steaming Aso massif, with Nekodake on the right. (See previous blog entry for reference.) 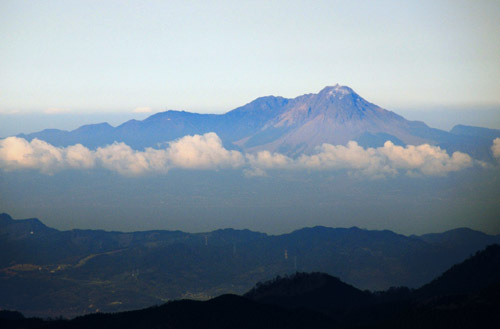 Beyond Nekodake, the Kuju Peaks, yet another group of active volcanoes, rise to heights of over 1800m. 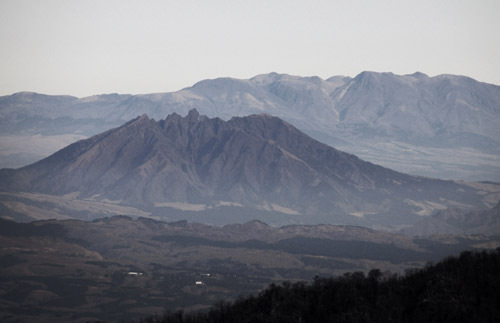 A closeup of the Aso peaks, symbol of Kumamoto Prefecture. Steam rises from the most active crater. A closeup of Nekodake, which we climbed last week. We vividly recall every bump in that jagged ridge we climbed over. Beyond, clarity of the Kuju peaks belies their 60km distance. Nekodake itself is about 40km from the camera. More volcanoes! To the west, Mt. Unzen, located in Nagasaki Prefecture not too far from our home. It is presently dormant but the lighter colored main peak was formed in its entirety in a huge eruption only about 20 years ago. To round out the volcanic views, Sakurajima near Kagoshima city could also be seen erupting a tall column of dark dust, far to the south. Sakurajima's been increaingly active lately, with a major eruption possible in the near future that will endanger the very nearby city. The erupting dust clouds can lately be seen even from low-lying Amakusa. 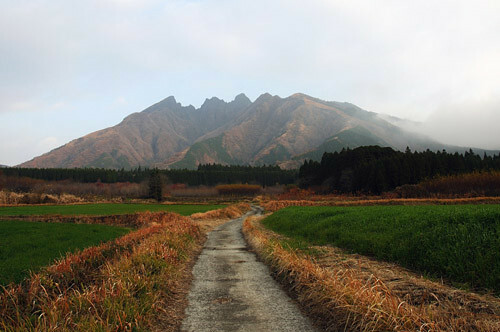 In the east, the pointed Sobo Peaks of Oita Prefecture present a sharp silhouette. Some rime frost remains on the Sekiryo ridges in the foreground. 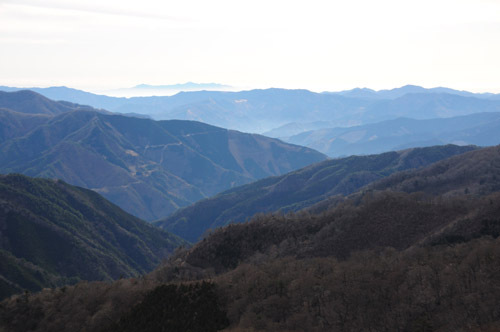 Looking southeast into the deep Shiiba Valley of Miyazaki Prefecture - a view that typifies the Sekiryo topography. The mountain in the distance is Osuzuyama, near the Pacific coast, a reportedly scenic place that we have yet to visit. while I snap pictures in every direction. 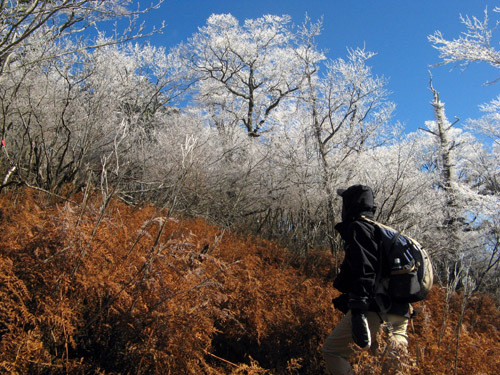 Trekking along the ridge in the virgin forest which is Sekiryo's main treasure. Such areas of relatively undisturbed nature are very rare in Japan, and seemingly becoming more so every year. Great timing. 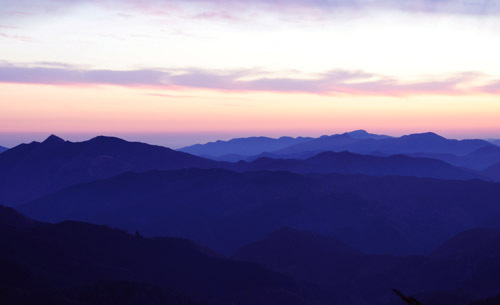 The sun goes down upon reaching Karimata-yama, the last summit of the tour, casting the overlapping ridges in purple shades. Hiking by headlamp, we are out on the road through Nihonsugi Pass within an hour after Karimata. Another hour or two later, after an exciting down and up hill in the dark, we've recovered the car and head for a soak in the hot spring, followed by an Indian curry dinner. Ah, the luxuries of life! 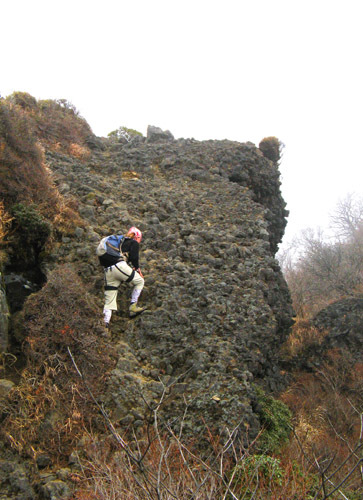 Large parts of the inland areas of Kyushu are volcanic in nature, including several active hot spots. The best known and perhaps most spectacular of these is the well-known Aso region, located near the geographic center of this, Japan's westernmost large island. 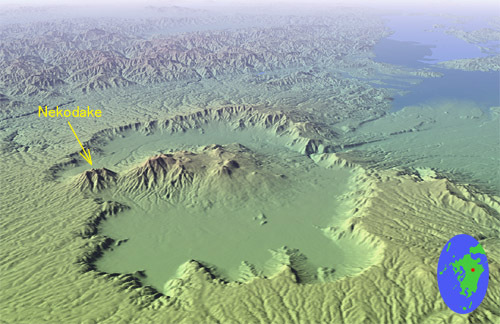 The simulated aerial view of the area below shows an enormous ancient crater which, at 20km in diameter, is said to be the largest such feature on Earth. In the middle of it is located Mt. Aso, a group of volcanic peaks in their own right, containing some of Japan's most active volcanic craters. On the east of this group, somewhat separated but still within the large crater, lies a unique mountain called Nekodake. 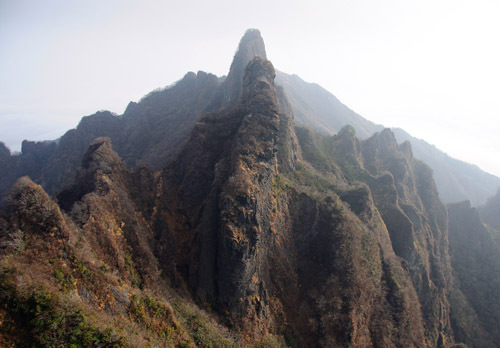 It thrusts towards the sky a bold, jagged summit ridge - a fantastic set of gravity-defying peaks and pinnacles covered with stunted trees reminiscent of old silkscreen reproductions that adorn Oriental-style restaurants the world over. Only after laying one's own eyes upon this landscape, one can finally believe that the ancient Oriental artists were not surrealists after all. The Aso area is one of the best-known tourist areas in Japan and because of this, beautiful as its natural landscapes may be, we generally tend to avoid it. The tourist traps lining the roads on the fertile crater plain are a little too depressing even to pass by, never mind the traffic jams that occur regularly every weekend. 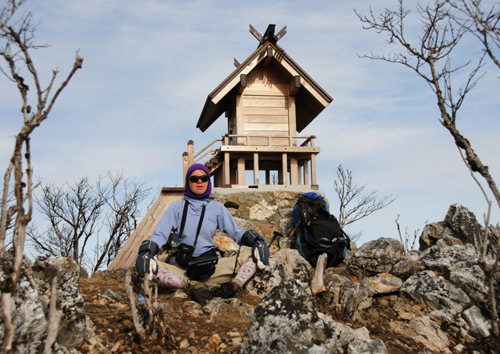 Instead, we prefer the Sekiryo Mountains, a sprawling and seldom-visited area slightly to the south, for our own private weekend hiking advetures. However, every once in a blue moon we venture to Aso for a stroll or a mountain bike ride. 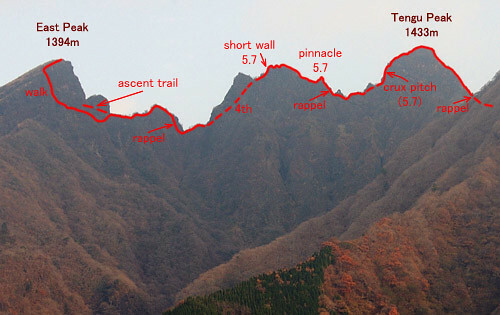 Last weekend, shaking off more than a year of dust from our climbing gear, we set our sights on Nekodake. Arriving on the scene at dawn, we avoided nearly all the traffic but our efforts to take an alpenglow picture of the mountain was thwarted by the misty autumn morning. Throughout the day, in spite of the clear weather forecasted, the summit ridge would drift in and out of clouds as a cold, damp wind blew. 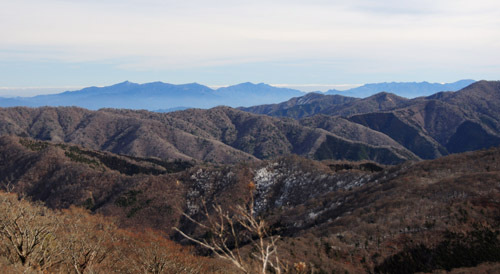 The spectacular Nekodake, seen from the Takamori plain on its south side. A brief summary of the technical difficulties encountered on the ridge. We consulted the web superficially to glean some information about the hiking trails that access the mountain, but purposely avoided looking too close at the technical details of the ridge itself, leaving those to be taken care of by our long-dormant mountaineering instinct. It is much more fun and exciting to do it this way, if the route does not strech one's technical abilities and experience. Even so, due to the absolute lack of information in English, a brief diagram of the approximate difficulties encountered may be useful to some. Going from west to east, we rapelled in three places, but with a bit more effort it is also possible to downclimb, or do the entire traverse in reverse. 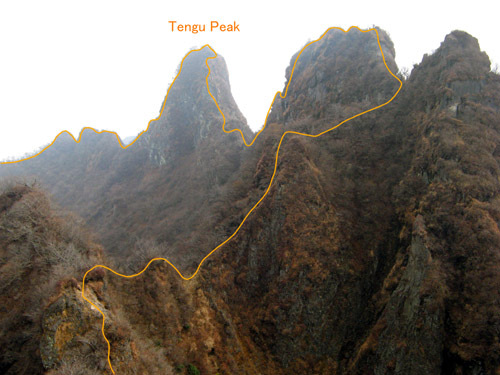 The picture actually shows only the west half of the traverse, but after rapelling off Tengu Peak, the mountain's main summit, the rest can be walked unroped if the correct route can be found. Whatever starting point one chooses, the traverse opens with a stiff, unrelenting climb straight uphill through bamboo and susuki grasses. 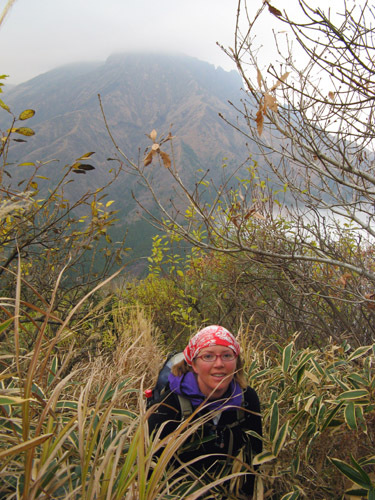 It had rained a few days before and the fine black volcanic soil was slick underfoot, adding to the effort of ascent. By the time we reached the ridge proper, our faces were flushed with the healthy effort. 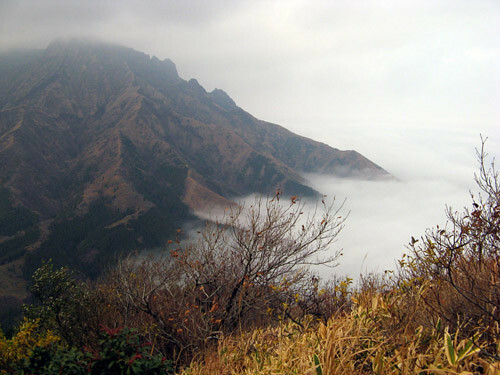 Looking back during short breaks, we could admire the mass of Mount Aso floating on a sea of clouds, though the summits of its legendary five peaks were enshrouded in the mists. Soon we crested the ridge and stood facing an unearthly, vertical landscape. 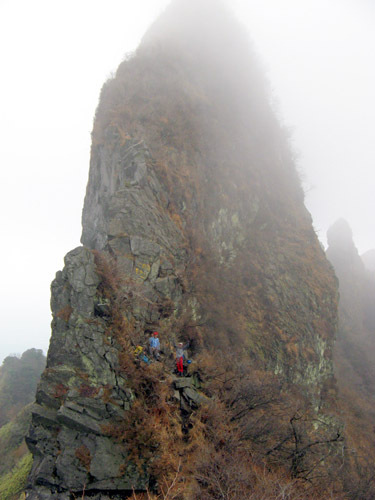 We could hardly wait setting foot upon the teetering pinnacles and knife-edge ridges ahead but first, for the sake of esthetics, we made a detour to the summit of the East Peak. With careful route-finding this summit can be reached by walking and some tree climbing only, so we left our packs on a handy ledge and after 20 minutes of pushing aside vegetation and heaving up on roots and branches, we stood on top and admired the grand view. Our packs could also be seen, deceptively close on their ledge but seemingly impassable terrain lay in between so there was nothing to do but to retrace our circuitous ascent route. Looking east from the summit of the West Peak. Finally we began the technical traverse proper, and for our mountaineering spirits it was a joy beyond description. With precipices of hundreds of meters on either side, and the ridge narrowing to a mere foot wide at times, we seemed suspended in a most unlikely, airy place. Here and there we roped up for a short rock pitch or rappel, but mostly we trod unroped, keeping careful balance and a lookout to stop the head from spinning. Leanne heaves up on a tree on a typical stretch of the ridge. A short, enjoyable rock pitch. The entire route is well-enough equipped with fixed gear so no rack is necessary and about 5 slings will do. 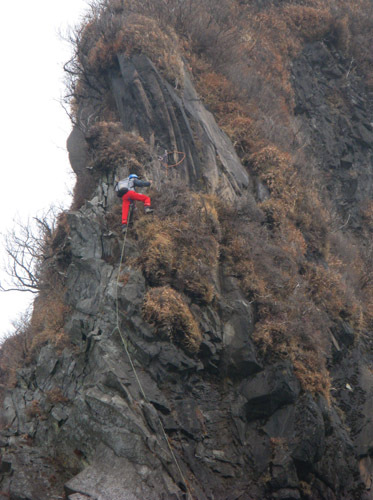 It would not be a bad idea to bring some extra webbing to beef up the often manky rappel anchors. Rick, clearly in his element, takes in the scenery and a deep breath of fresh mountain air from the top of a very exposed pinnacle. 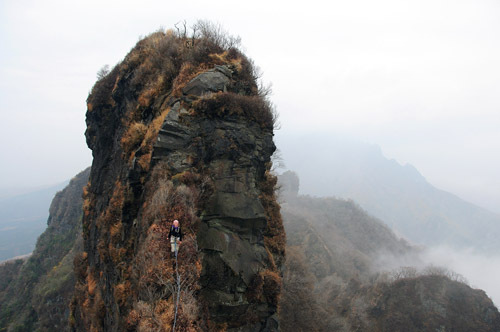 Leanne negotiates a breathtaking knife-edge connecting two pinnacles along the ridge. 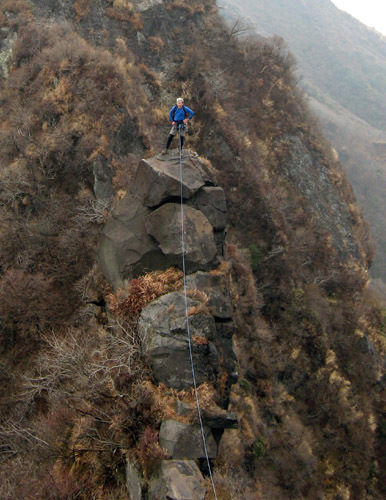 The leader of a party of climbers from Fukuoka negotiates the crux pitch, an enjoyable 30 meters of slopey holds on surprisingly solid rock. Mucho fixed gear makes this stretch perhaps the safest part of the whole ridge. After the final rappel off Tengu Peak, we set off ahead while the Fukuoka bunch enjoys a break and a snack, perched on a comfortable ledge. With swirling mists and a cold wind, Nekodake climbers enjoyed alpine conditions on the mountain today. As the cold rock we gripped chilled our fingertips, we were reminded of summers spent climbing in the French Alps. How lucky to have found a convenient substitute only a few hours' drive from our home! 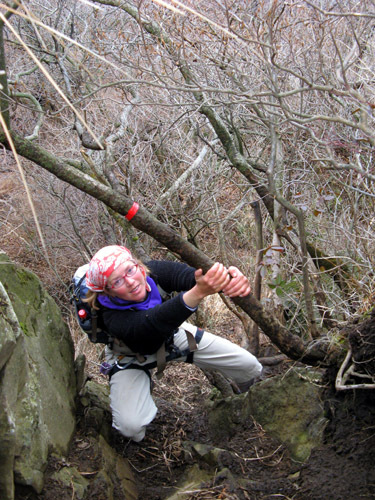 Leanne treads upon an interesting rock formation along the ridge between Tengu and West Peaks. 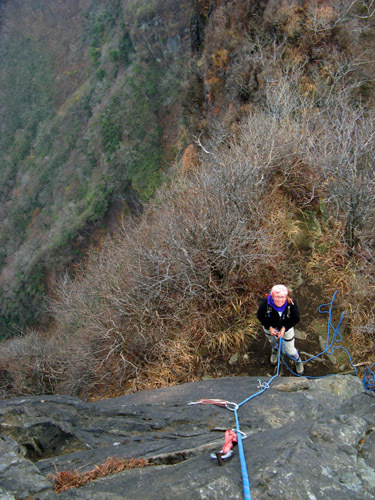 After the Tengu rappel, it's all walking, but the scenery remains exposed and spectacular. Twice more one gets to step over the abyss via narrow gaps in the ridge. 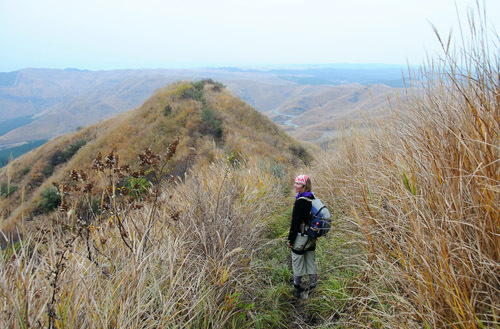 Hiking down the East Peak on a pleasant if slippery trail through the grasslands that are so typical of the Aso area. These grasslands are actually man-made; reforestation is prevented by an anual winter burn-off of the slopes, ostensibly to keep them as pastureland. But cows are fewer than SUV's on these uplands and the burning has become a major tourist attraction that has lent Kumamoto Prefecture the tourism moniker 'Land of Fire' (also referring, of course, to the volcanoes). As a cloudy Sunday turned into a drizzly evening, we bypassed the main exit of the crater, gridlocked by traffic returning to nearby Kumamoto City, by a convenient 2-km-long tunnel under the crater rim which, strangely enough, was nearly devoid of cars. It's likely that only mountaineers can understand the dimensions of rejuvenating power that the mountains have to offer. Its effects are still with us days later, more powerful than that of sleep, food, pharmaceuticals, therapy, or any other elixir we can imagine.